today I'm reviewing two books about the Italian school system, its main flaws and the challenges it faces. Even if you don't live in Italy, you have probably heard that academic standards here are at an all-time low and our students often fare among the worst in tests performed by organisations such as the Organization for Economic Cooperation and Development to measure the effectiveness of school systems in Europe and the rest of the world. If you have wondered why that is, these books will provide the answers. And it is very sad to see how, with every passing year, things have got worse and worse. 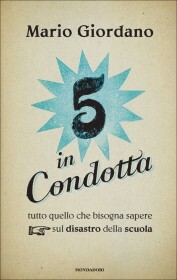 5 In Condotta by Mario Giordano is a book about everything that's wrong with Italian schools and education. And although I finished high school more than 10 years ago now, by reading the book I realised that not much has changed since then. If anything, things have gotten worse. At least, I was taught maths, literature, grammar, geography and all those subjects that are taught in schools all over the world, while Giordano has found in his research that most teachers don't have the time to teach them anymore. Why? Because schools now organise short courses on ecology, healthy eating, ancient toys, kung fu, on how to analyze song lyrics or how to sew (but only for boys). While I agree that all these things are useful (some more than others obviously), they are extra curricular activities schools should provide courses on after the regular day of lessons is over. Another problem is that even students who have serious gaps in several subjects are admitted to the next form. Unless they don't go to school for months or have really bad marks in all subjects, they won't fail, so they have no incentives to study and do well. And then there are the teachers. They can't be fired, not even when they pretend to be ill not to work or accept the job but never set foot in the school cos they are employed somewhere else as well. More worryingly, they are not fired even when they abuse students. They just get transferred somewhere else. Of course this is true only for permanent teachers. There are lots of other teachers who are hired for a few months or a year and don't know whether he/she will still work next year. They work just as hard but are underpaid, don't have any benefits and are always uncertain about their future. In addition, even when you find a good teacher, they have to take care of so much bureaucracy and paperwork that, when they set foot in class, are demotivated and slowly lose the passion for their job (it was really heartbreaking to see that happen to my English teacher). Parents have their faults too. They expect teachers to be also parents, yet when a teacher wants to punish a child, even with just a note on the register, they complain. And if their child isn't admitted to the next term, they'll sue the school. Even bullies can't be punished. No matter what they do, how horribly they torture their victims or damage school properties, the worst punishment that can be inflicted on them is being suspended for three days or forced to pay for the damages they caused (but these are usually paid for by their parents). Parents should teach their children manners, respect and how to behave, and make sure they do their homework when they get home, but if they want to delegate all these responsibilities to teachers, they should also give them the power to punish students as they see fit (without becoming violent or anything like that obviously). Otherwise, it's useless. Fixing these problems is not easy, especially when, every few years the government changes and every new education minister comes up with his/her own reform. After they pass, they can only be implemented for such a short time before the new minister repels it and substitutes it with his own that there is not much time to see if they were effective in the first place. This also causes a lot of confusion for the students, especially those facing their final exams, as they never know what to expect. But still, whenever a minister announces a new reform, the students and teachers will protest before even knowing what it is about. They seem to want improvements without changes... So, what to do? That's the main fault of the book. While it realistically portrays the terrible and degraded situation Italian schools are in now, it doesn't suggest any solution to all these problems. But all in all, a very interesting, although frustrating, read. The situation of the Italian school system is alarming and serious today but things weren't better in the 60s. 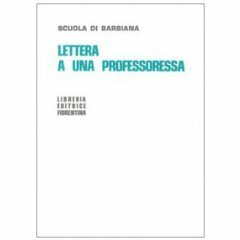 That's why the students of the School of Barbiana, founded by priest Don Milani to give an education to poor children, wrote, in 1967, a book about everything that was wrong with the school system at the time and proposed solutions to them. The book is without doubt an important historical document, but its critics say that it is greatly to blame for the reforms that followed and that plunged Italian education into the crisis it faces today. I believe they partly misunderstood the message of the book, but it is also true that some of the reforms they suggested have been implemented with disastrous results. The students of Barbiana, a small and poor village in Northern Italy, for instance wanted a school where interrogations were abolished and everyone was admitted to the next term even if they had serious gaps in most subjects. Well, they got their wish and lots of students today finish schools without even being able to talk their mother tongue correctly, let alone another language, for example. Yet, to understand why they proposed something like this, you have to understand how things worked at the time. Back then, schools accentuated the differences between poor and rich students. Rich students, because of the environment they lived in, already knew how to talk proper Italian and had already learned in their family most of the things then taught in schools. So, it was easy for them to be admitted to the next form. Poor students, on the other hand, could speak only their dialects and knew everything about agriculture, animal farming and the current political situation but, when they had to read a poetry written in archaic Italian or aulic language, they didn't know where to start. They thought it was useless to teach subjects like Latin no one spoke anymore, or complicated mathematical problems that just weren't useful in real life. Add to that, that school hours were short and teachers often didn't have the time to help these boys overcome their problems, and you'd see why they would often fail. Teachers thought repeating the year would be helpful for them but, in fact, most of these students just never returned to school. They would just get a job, even if that was against the law. As a result, the lower classes would remain poor and uneducated, while the rich and educated classes got easy access to well-paid jobs. The students of Barbiana thought that, by admitting everyone to the next term, and teach only things that had practical use in real life, poor children too would have an education and a better chance in life. Noble intentions, but the way to make them come true they indicated just wasn't always the right one. However, they did make some useful suggestions which sadly weren't as heeded. For instance, they believed newspapers should be read in classes and that school hours should be extended (in the school founded by Don Milani, school lasted from morning till evening). Overall, this is a great book to read if you wanna know more about the situation and problems of Italian schools prior to 1968, when reforms to shape the school as it is now started, but you need to keep an open and critical mind about the solutions proposed because, even though prompted by the best intentions, some of them would have (and have had) disastrous consequences.